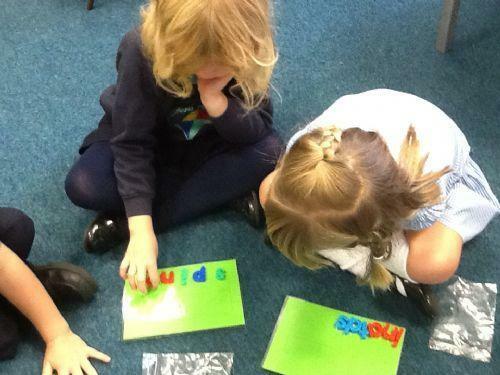 What do I need to know about the teaching of phonics in the Reception class? As you have probably been made aware by your child, we have started phonics in the reception class. We follow a structure for teaching set out in Letters and Sounds (Primary Strategy England) in addition to developing a continuum of skills set out in documentation produced by Cardiff Advisory service. Children are grouped each day for around 15 minutes to complete fun, practical activities which will support their developing awareness of sounds in words. Their groupings are not based on "ability" but on the stage of development in their understanding. For some this will mean they have begun to segment and blend sounds together to make words.You can encourage them to transfer this skill into writing. For others they may be following a structured introduction to letter learning. For others, they may still need to develop an understanding of sounds in words and the ability to discriminate between them before a more formal introduction to letters. You can help your child through games such as I spy, or by practising spelling out words orally c-a-t. It is very important that as you support this emerging skill you use only the sounds of letters rather than the names a-apple (rather than ay) Also it is essential that children learn to write letters in lower case with the correct orientation. Learning an incorrect orientation can be difficult for the child to put right later. More information will be given at the Coffee Morning or you can ask your child's class teacher for advice. There are many games available on the internet that your child will enjoy playing and that will help develop their understanding.